This hammock stand is the best choice for you. This hammock stand features space saving design. It can disassemble into different parts which can be packed into carring bag. It is convenience for you to take it anywhere you want. It is strong and sturdy enough to hold 2 average adults weigh up to 440 lbs. 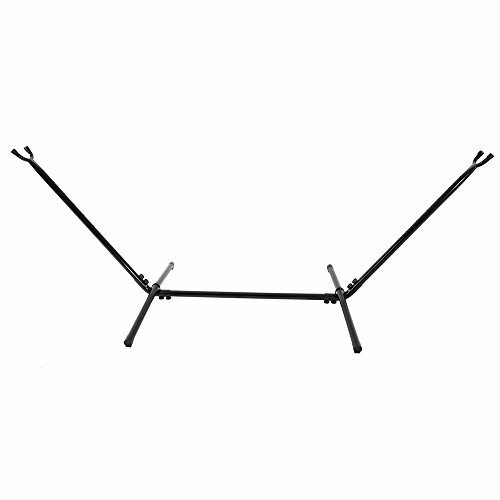 This universal hammock stand can accommodate string style hammocks that are approximately 9' to 11 1/2' total length. Each end has 6 holes spaced 4 inches apart allowing for complete adjustability of the hook. Note: Package only contain hammock stand and carring bag. It is not recommended for very large hammocks, otherwise the hammock will sag and hit the floor with an adult weight on it. Dimensions: (102.3 x 41.33 x 39.37)" / (260 x 105 x 100)cm (L x W x H). The detailed dimensions refer to the product picture.